Over the weekend, I was asked to lead a cooking party, teaching a group of ladies how to make pasta, along with a few other things – but pasta was the main attraction. As you may know, I posted this recipe a few weeks ago when I made it with Momma Marsha, and neither her nor Nate were huge fans. They said it was fine, but something was missing. Seeing as though I planned to make it for this cooking party, I had to perfect it. Funny enough, all I did was add more cheese (mozzarella). Also, I used whole milk ricotta, rather than low fat, hoping it would give more flavor (though I don’t think ricotta has much flavor to begin with, which was probably part of the problem during the first run through). And it did, at least, that’s what Nate thought because he loved it the second time around. Note to self: if something doesn’t taste just right, add more cheese. The ladies seemed to be pleased as well, so I would say this re-make was a success! I also changed the pasta dough recipe, as Chef Bush’s didn’t seem to work as well as the one I made with Momma Marsha. Much easier to work with. 1. Make the smoked onion tomato sauce. Place onion slices in foil and lightly wrap. Smoke in electric smoker on low for about 4 hours. Preheat oven to 350. Transfer onions from smoker to oven and cook until onions are soft, about 1 hour. In a food processor, pulse onions until coarsely chopped. 2. In a medium saucepan, bring tomatoes to a simmer. Add smoked onions and season with salt to taste. Simmer for 15 minutes to incorporate the smoked flavor. Place tomato mixture in food processor and pulse to make a slightly chunky sauce. 3. Make the pasta dough. Mix all ingredients in a food processor. It’s important that the dough not come together, rather resemble coarse cornmeal. Turn mixture out onto work surface and knead a few times. Add a few drops of water if the dough seems too dry. Wrap tightly in plastic and refrigerate at least 30 minutes, or overnight. 4. Make filling for ravioli. In a large skillet, heat oil over medium heat. Add garlic, and cook until fragrant, about 1 minute. Add Swiss chard and cook until tender, about 5 minutes. Transfer chard to a mixing bowl and let cool. Add egg, breadcrumbs, salt, nutmeg, ricotta and mozzarella. Mix until all ingredients are incorporated. Set aside. 5. Separate dough into 4 portions. Using one portion, keeping the rest wrapped in plastic, knead and begin to roll out into sheets using a pasta roller. Place scoops of 1 tbsp filling on pasta sheets, leaving at least 2-3 inches (depending on how large your ravioli cutter is) and cover with second sheet of pasta. Press the dough firmly together around the filling, trying not to leave any air pockets. 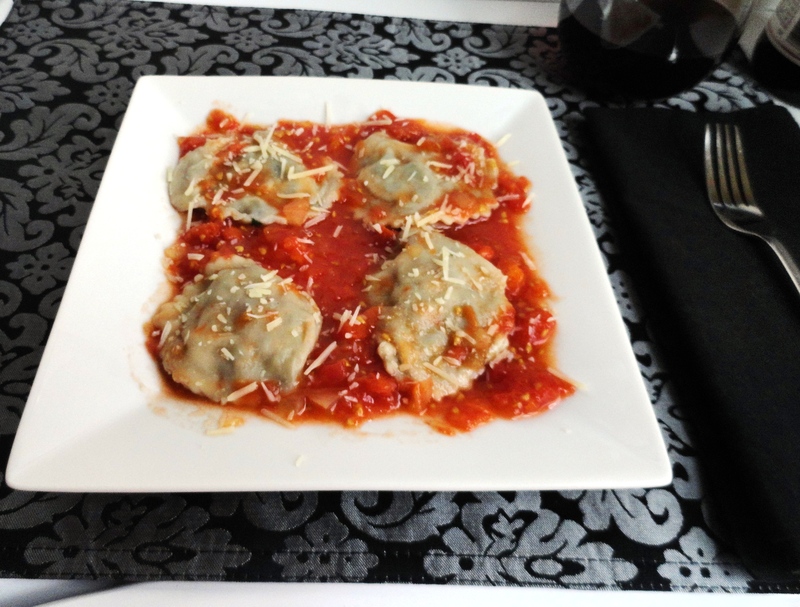 Cut individual ravioli with round cookie cutter or ravioli stamper. Repeat for remaining dough and filling. 6. Bring a large pot of salted water to a boil and add raviolis in batches, being sure not to crowd the pan. Boil for 3-4 minutes, remove and toss with smoked onion tomato sauce. Serve and garnish with parmesan cheese if desired. Speaking of getting married, this recipe comes from Executive Chef David Bush at St. Francis Winery, where we had our dinner in Sonoma, CA after our ceremony. This was by far the most fantastic meal I have ever had, maybe closely followed by the first food and wine pairing we’d done there in November of 2012. 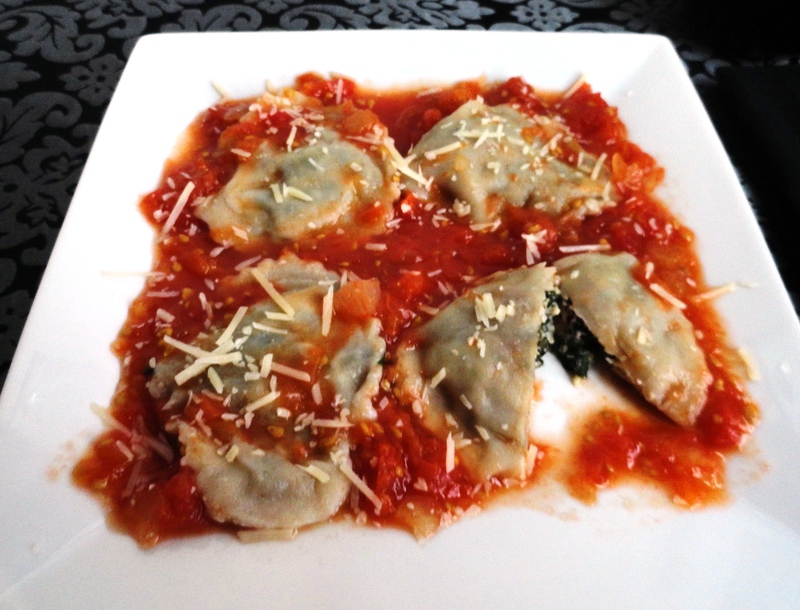 As you probably know, I’m not big on cheese, which may make you wonder why my first attempt at homemade pasta would be cheese filled ravioli. Well, I’m cooking for a dinner party next month, and my client (sounds so official!) decided her and her guests would like to make homemade pasta, and we agreed on ravioli. So, that being said, I was determined to make this amazing sounding recipe from Chef Bush in hopes it would be perfect for this dinner party. Making the pasta was actually a lot easier than I imagined. Momma Marsha and I spent an afternoon trying to man her pasta roller (its the kind that should hook to a countertop, but she doesn’t have a place to do so, so we had to hold it, crank it, and feed the dough in all at the same time – this would have been impossible if it were just me). 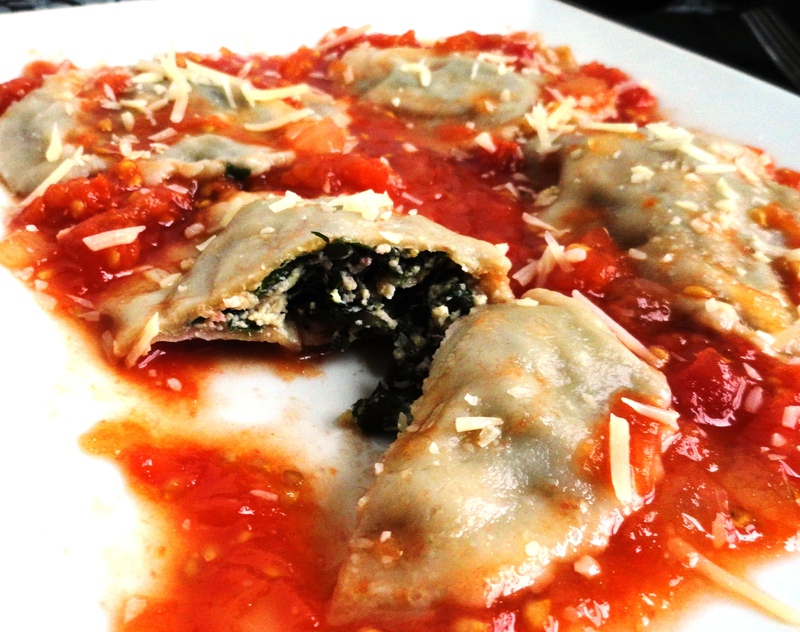 I made a few raviolis sans cheese, so more or less just Swiss chard, but most were by the book so Momma Marsha, Leo (my FIL) and Nate could try them and give me their honest feedback. Unfortunately, the feedback wasn’t what I was looking for. However, I’m always glad to hear the truth, especially so it can be improved and better for the dinner party. The ricotta fell flat, so for next time, I think I’m going to opt for a blend of cheeses. The star of this recipe, however, was the smoked onion tomato sauce. I absolutely loved it; it would be fantastic on spaghetti with sausage (lightbulb!). If you don’t have a smoker, I think it’d be just as easy to roast the onions and add a touch of liquid smoke. Never tried it, so don’t take my word for it. But if you do try it out, let me know how it turns out. All in all, this recipe is still a work in progress, but I wanted to be sure to share even my not-so-great recipes. Though, again, the tomato sauce was killer! 2. In a medium saucepan, bring tomatoes to a simmer. Add about 4 tbsp of chopped smoked onions and season with salt to taste. Simmer for 15 minutes to incorporate the smoked flavor. Save remaining onions for another use. Place tomato mixture in food processor and pulse to make a slightly chunky sauce. 3. Make the pasta dough. Mix all ingredients in a food processor. It’s important that the dough not come together, rather resemble course cornmeal. Turn mixture out onto work surface and knead a few times. Add a few drops of water if the dough seems too dry. Wrap tightly in plastic and refrigerate at least 30 minutes, or overnight. 4. Make filling for ravioli. In a large skillet, heat oil over medium heat. Add garlic, and cook until fragrant, about 1 minute. Add Swiss chard and cook until tender, about 5 minutes. Transfer chard to a mixing bowl and let cool. Add egg, breadcrumbs, salt, nutmeg and ricotta. Mix until all ingredients are incorporated. Set aside.